Anyone fond of vinyl records or other collectibles knows the excitement of heading to distant territories and making unexpected finds in dusty boxes. 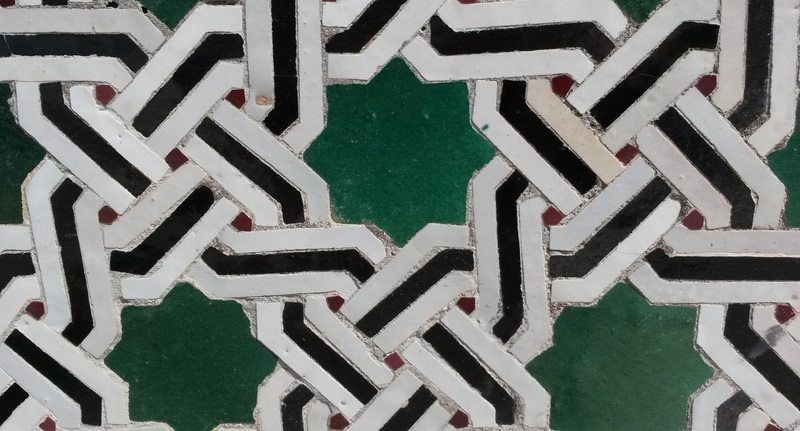 Before leaving on a 12-day family trip in March, our destination Morocco did not look like a promised land in this respect, and for most of the time, this assumption was true. During my previous visits to the country I had gathered a sizeable collection of cassettes, with the focus on local folk, less on Oriental pop and raï and had managed to pick up also a tape version of the legendary Nass El Ghiwane’s self-titled album. During this visit, the tapes were not of interest for me – although some outlets still sold them and even saw an untouched five-pack of 1990s TDK cassettes. Instead, the wax hunt started. 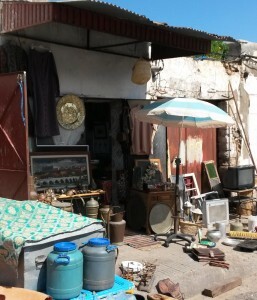 Because of having only a short glimpse of Casablanca, I skipped the famed metropolitan outlets Le Comptoir Marocain de Distribution de Disques and Disques Gam in favour of shabby neighbourhoods in other cities. Our base station during the first half of the vacation was Mohammedia, a no-hassle seaside city between Casablanca and Rabat that turns to a vibrant resort during the summer months. We enjoyed local hospitality in a family of friends and I hoped to rely on their expertise to track down some gems. They were pretty puzzled hearing about my interest in ‘tourne-disques’, but kindly promised to keep their eyes and ears open. In Marrakech, our next stop for three days, we found something rare: the heaviest rainfalls for the last one and a half years. This kind of weather would have been perfect for crate digging in music dens, but I just couldn’t find any promising locations. The area around Bab Doukkala was mentioned in a forum post as a potential place to look around and when taking a cab there the driver nodded enthusiastically ‘oui monsieur, il y a des 45s’. I even found a couple thrift shops that sold broken radios, kitchenware, worn-out furs and a messy selection of books, but no records. Taking a drive back to the Mellah region, another taxi driver claimed it’s the place to look, but all my efforts were to no avail. Before returning to Mohammedia, we visited for a day Rabat and the hopes were starting to fade. 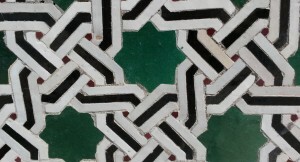 But during the brief stay in the Moroccan capital my search was fruitful. Literally in the 24th hour, shortly before the departure, I stumbled upon a neighbourhood at Rue Souika, close to the river Bou Regreg dividing Rabat and Salé. Although in the proximity of attractions like Kasbah des Oudaias and the beach, I hadn’t been there before, even not during a two-month stay back in 2001. It was a Friday morning and during a stroll I noticed a pop-up flea market, which was placed around little thrift shops, and people were selling all kinds of impossible stuff, from real trash up to practical things. I started examining the shops and immediately found a stack of Arabic 45s from the 1970s. They looked in a very bad condition, but still playable. The shopkeeper asked about €1 (10 Dh) for each of them and after brief bargaining I got a bulk price. He pointed at another pile of records, twelves with a random selection of Western music from 1970s disco and pop to adult rock, but nothing I felt excited about. The entrance of the shop where I found Rimitti’s singles and other interesting stuff. Meanwhile I met our friend Hicham who had hit the same spot and suggested me to look around in the area. The owner of the next shop looked more conscious about the music because he had put some cheapo singles to a box at the storefront and had a number of old radios and turntables to sell. He waved me in and showed a pile of records, Arabic stuff again, mostly from the 1970s, some maybe older. 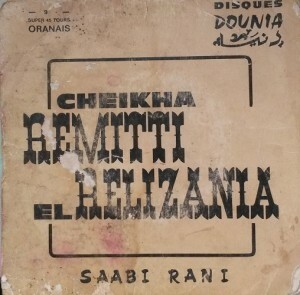 Immediately I noticed a couple of seven-inches by Cheikha Rimitti, the Mother of Raï, in addition to various pop and folk records from the region. He had also a stack of European releases, including a Hooj Choons EP and some Todd Terry remixes, but not much electronic or otherwise interesting stuff. The owner, sensing my mistrust about the condition of the items, made a quick test on a vintage turntable and helped to find right sleeves for the records, because they were mixed up. The owner was also more conscious about the pricing, asking about €2 (20 Dh) for each, but unless you are buying something in pharmacy, you need to bargain in Morocco and the price dropped by about 50 percent. In total, I got 37 singles from two shops, paying about €36 for all of them. I really don’t know what their market value is, because only a few are listed in Discogs and several even don’t exist in the Web search results. The output should have been massive because some catalogue numbers go over 400, but Discogs has only about dozen entries about the label. Many records are greasy, warped, with heavy surface noise, and the sleeves mouldy, with moisture damages, but still I’m happy with the outcome. As were our friends in Mohammedia who recognised several Moroccan stars from back of the days. Except for Rimitti, the artists did not ring any bell for me, but by the origin they could be divided to two groups. 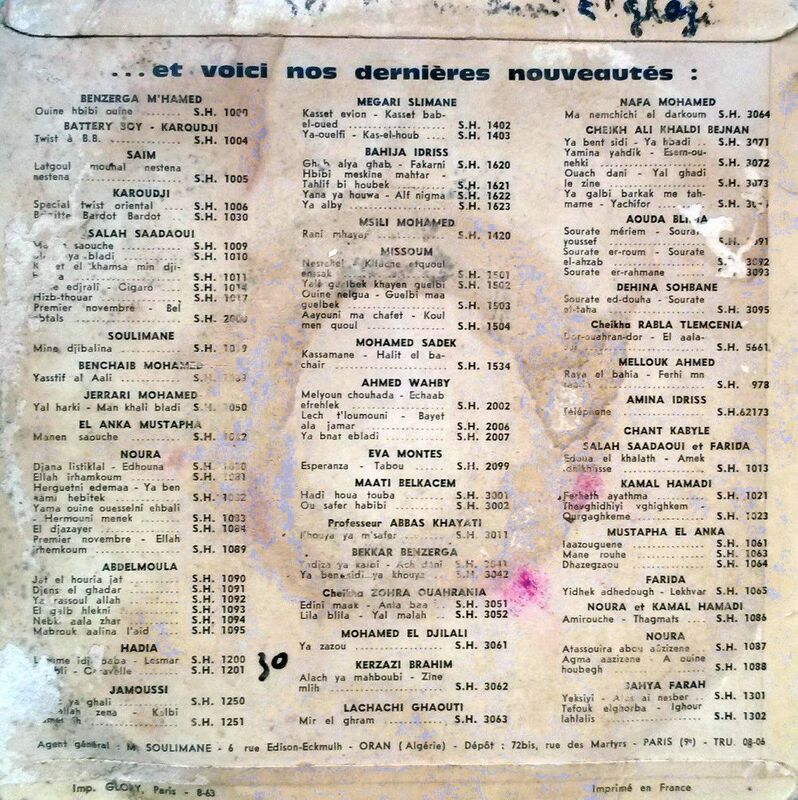 Firstly, Moroccan artists-chanteurs on labels like Casaphone, Boussiphone, Koutubiaphone or Ifriquiaphone and then mostly Algerians from outlets like La Voix D’Algerie, La Voix Du Globe, Disques Dounia, El Ouahida, some of them headquartered in Paris. Rimitti’s courageous and powerful chanting is a treat that can be said about other ‘cheikhas’, i.e. female singers, whose strong vocals and powerful, percussive arrangements are giving strong thrills. A couple of great tunes also from the Moroccan side, like Fatima Zahafa or Ali Latnsani, but it’s true that I still have to clean and try out the vast majority of the ‘Souvenirs du Maroc’. For a closer look to early Moroccan music, a new compilation, “Music of Morocco: Recorded by Paul Bowles, 1959″, has been released by Dust-To-Digital. A silkscreened cigar box with foil stamping details throughout, 120-page leatherette book, and four CDs containing 4 hours and 30 minutes of audio. Cheikha Remitti, the Mother of Raï, in this early release of Disques Dounia. 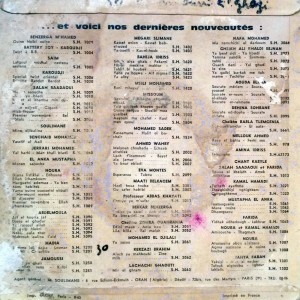 ‘Recent new releases’, there were quite a few mentioned only on this sleeve backside. 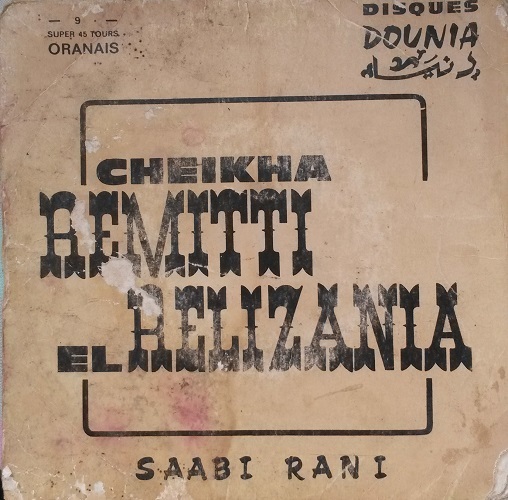 Sound example from Cheikha Rahma El Abassia’s single, one of favourite finds in Rabat. The A-side of a single from Berber aita singer Souad Ahmed.